A late goal from winger Grant Anderson was enough to secure a hard-fought 2-1 win for Raith Rovers against Falkirk in an entertaining league clash at Stark’s Park this afternoon. Rovers stuck with the same formation as of late, with Simon Mensing once again employed in a holding midfield position. Pat Clarke took his place up front in the starting eleven at the expense of the suspended Brian Graham. In a lively start to the match, it was the away side who created the better chances, with Taylor twice shooting wide of the target from a promising position inside the Rovers penalty area in the opening ten minutes. Allan Walker had Rovers’ first shot with 15 minutes played, following good work by David Smith down the left wing. 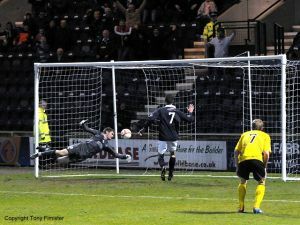 However, the Rovers captain screwed his shot well wide of the target from just outside the box. Five minutes later, a neat exchange of passes between Grant Anderson and Jason Thomson on the right wing gave the home side their first corner kick of the match. Walker’s floated cross then fell to Anderson, whose half-volley from ten yards flew narrowly wide of the goal. Rovers enjoyed the bulk of possession during the opening period, although Falkirk looked dangerous on the break down the right flank. However, young goalkeeper Ross Laidlaw, deputising once again for the injured David McGurn, demonstrated sound handling of any crosses inside the penalty area. 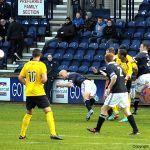 On the half hour mark, Pat Clarke lined up a free-kick from 30 yards out, although his weak effort was easily cleared by the Bairns’ wall. Shortly afterwards, the home support was entertained by the sight of Falkirk manager Steven Pressley receiving a lecture from the referee at the touchline. Greig Spence then tried his luck with a sharp turn and shot, although his effort was comfortably smothered by Falkirk keeper Michael Mcgovern. As half-time approached, it looked as if the teams would go in level. However, Falkirk conjured a goal out of nothing to take the lead as the fans prepared for a bovril to stave off the winter chill. A harmless-looking ball was played into the Rovers box, although the home defence failed to clear. The bounce evaded Laidlaw, and fell invitingly for Luke Leahy, who nudged the ball over the line via the far post despite the best efforts of Rovers left-back Eddie Malone. Rovers’ determination to restore parity at the start of the second half was perhaps demonstrated by the fact that both Greig Spence and Malone had found their names in the referee’s book within a minute of the restart. Despite the fact that it was the away side who were on the front foot at the start of the second period, Rovers should have levelled the scores ten minutes in. A swerving cross from wide on the left by Malone fell invitingly for Allan Walker, who was unmarked with a clear sight of goal six yards from goal. 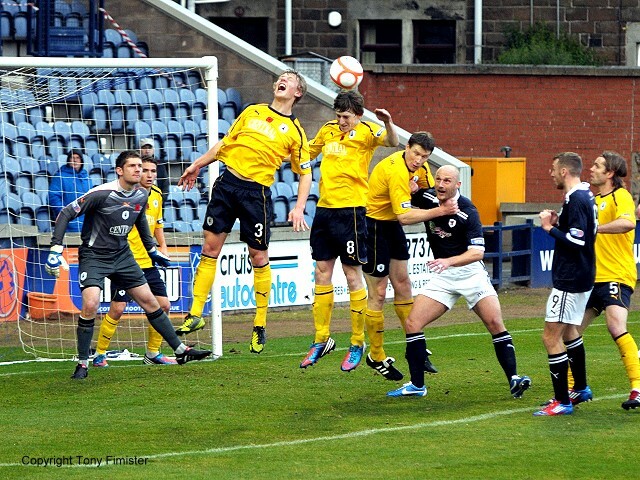 However, the midfielder’s header was badly misjudged and flew high over the bar. 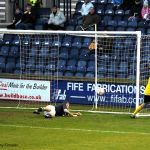 a promising position on the edge of the Falkirk penalty area, although tenacious play by David Smith won the ball back for the home side. 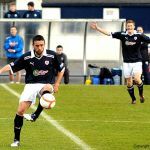 The youngster’s shot from 20 yards took a slight deflection off a Bairns defender before beating McGovern low to his right. 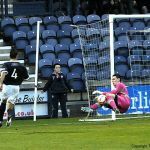 Rovers, buoyed by the equaliser, went in search of a second goal, and loud appeals for a penalty when Allan Walker appeared to be impeded inside the box failed to impress the referee. With twenty minutes remaining, Greig Spence shrugged off the attentions of his marker, although the striker rushed his shot, which presented an easy save for McGovern. Pat Clarke’s free-kick from over 25 yards then stung the fingers of McGovern, before a fine run and cross by Anderson agonisingly eluded the in-rushing Spence. 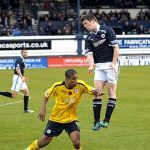 Man of the match David Smith tormented the Falkirk defence at every opportunity, although the winger had clearly been ear-marked as the main threat for the home side as he was shadowed by two or three opponents each time he gathered the ball wide on the left. 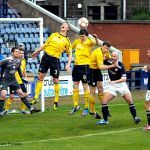 However, as the match entered its final few minutes, Smith would have a say in ensuring the three points would remain in Kirkcaldy. 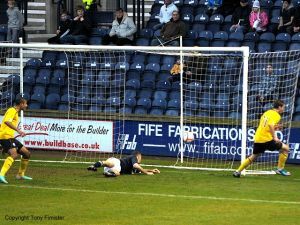 The winger pounced on a loose ball deep inside the Falkirk penalty area, and his clever pass across the face of goal was forced into the net at close range at the second attempt by Grant Anderson. 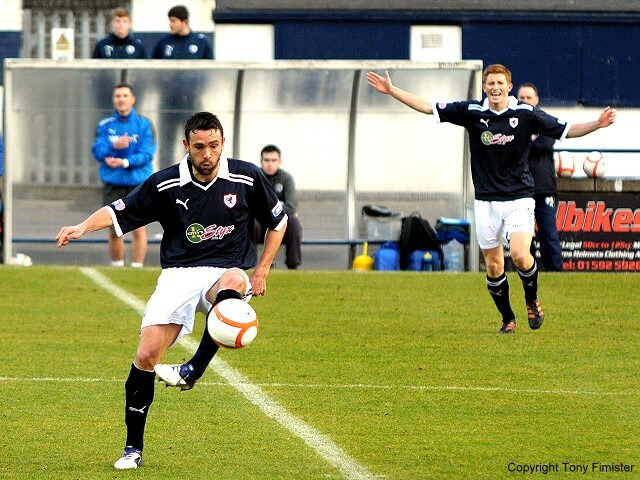 Falkirk pushed forward in a final effort to secure a point, but the Rovers defence held firm. Despite the match being contested in a good spirit throughout, yellow cards were shown to a number of players, especially those in dark blue. Hill, Clarke and Ellis were booked during the closing stages, before the final whistle finally sounded several minutes into time added-on. For all the negativity surrounding Scottish football at the moment, this was in truth an entertaining 90 minutes for the fans, and both sides can take credit for contributing to an open and flowing contest. Rovers will be delighted to take three points, and can look forward to next weekend’s derby match against Dunfermline with renewed confidence. A wee word from the club chaplain, followed by a perfectly observed minute's silence for the fallen. Decent curling shot from Falkirk just wide of the post. Laidlaw had it covered I think. From the resulting corner Anderson blasts a shot past the post - nearly great! A good spell of play by Rovers ends with a corner being headed clear. Rovers dominating play, but Falkirk look dangerous on the break. Decent game so far. 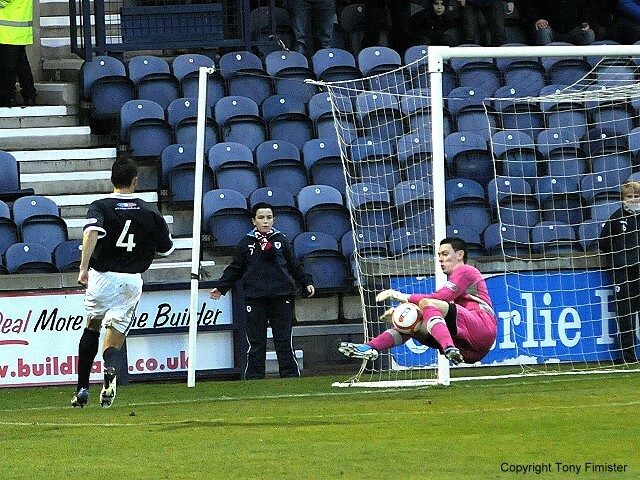 Goal for Falkirk. Taylor looked well offside, but hooked it to Leahy at the back post to knock it in. Unlucky to go in behind, the goal seemed to be in slow motion. 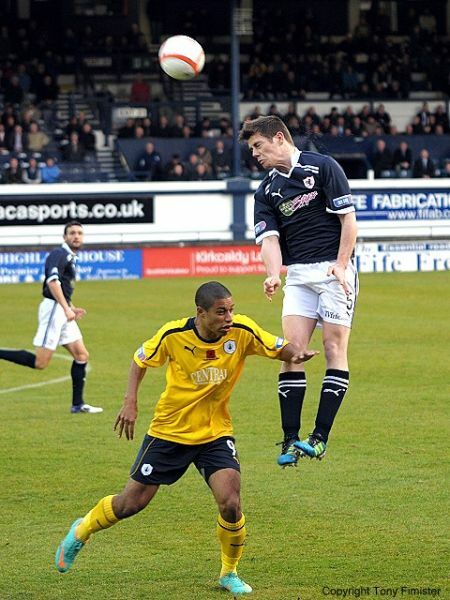 Not too much wrong with Raith's performance otherwise. GOAL!! Smiths driven cross is forced home at the second attempt by Anderson.